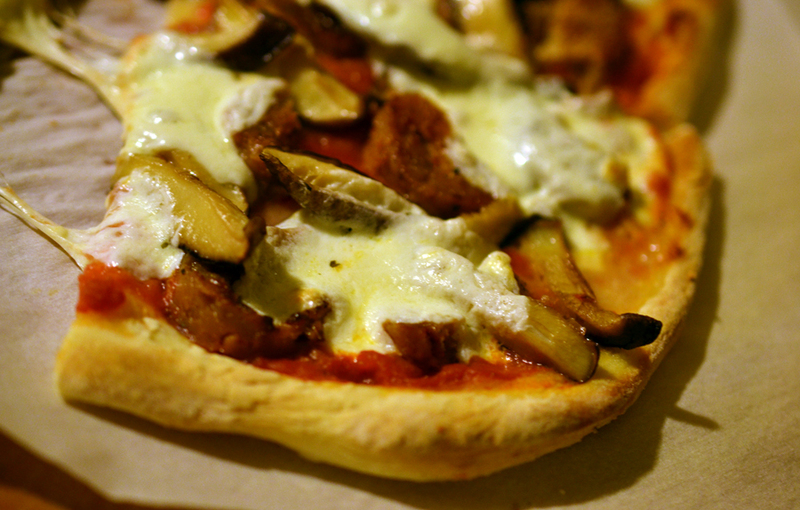 Home » Uncategorized » Pizza Night! Homemade pizza nights are a pretty big deal in the Cameron household. 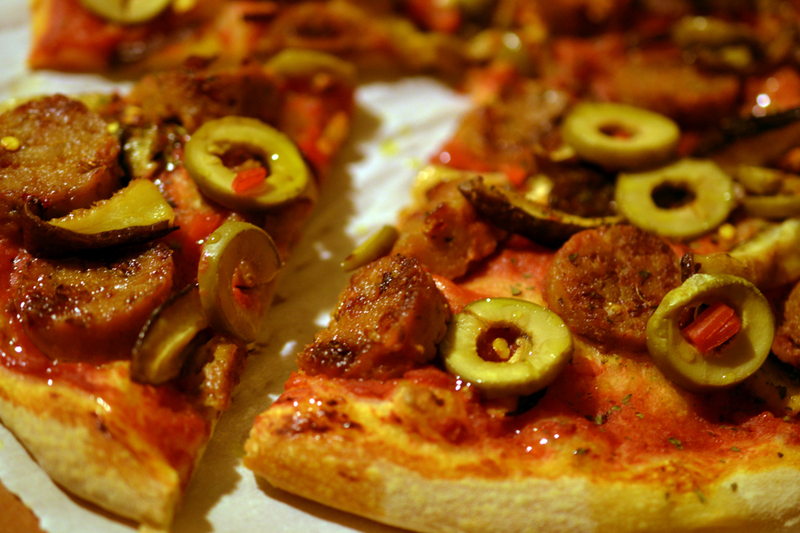 We love customizing, and we love “easy”, and pizza nights satisfy both. We love stocking up on fresh pizza dough whenever we’re at Whole Foods – easily the cheapest source for good quality dough in the area. For $2.99, you can grab a huge, fresh ball in the deli section that yields two decent-sized pies. Buy a can of crushed tomatoes and various toppings, and bingo. Kevin’s pies tend to have lightly-browned field roast sausage (spicy Italian style), shiitake mushrooms, green olives and spicy herbs. This time I used some of the field roast sausage as well, but with some garlic on the base and also fresh mozzarella atop the shiitake mushrooms. What’s your favorite kind of pizza toppings? We plan on trying out some vegan versions with Beyond Meat in the near future – I’d also love to emulate a dish I had at Carmelita one season years ago with a sunchoke and roasted garlic puree base, maitake (hen of the woods) mushrooms and truffle oil. One Comment on "Pizza Night!" I’m currently obsessed with gorgonzola, mushrooms, and basil pizza. I can’t stop making it! I’d really love to try shaved asparagus as a topping, though, I’ve heard great things.